A few weeks back, I was at the grocery store in the baking sections and found these Andes Mint Baking Chips and had to buy them. I had it in my head that I would make cookies with them but wasn't sure what I would do. 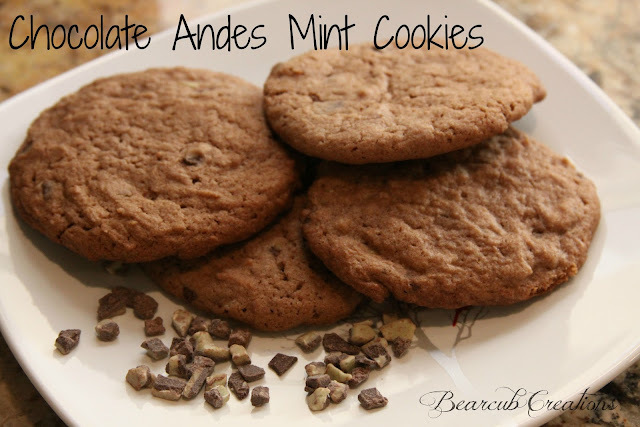 After making my Hot Cocoa Chocolate Cookies last week, I fell in love with the batter and decided to make the same batter but throw these Andes Mint chips in and I think I liked these better. I liked the subtle chocolate cookie flavor with the hint of mint. Fold in the Andes Mint Baking Chips. Do not use the mixer because it will break the bites into pieces.